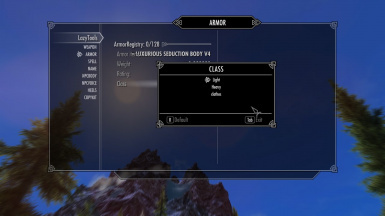 Raven's Luxurious Seduction Mashup - CBBE Bodyslide Conversion This is no longer a requirment, but if you dont use racemenu you will need this to prevent boots from sinking into the ground. Wnisewond's Followers - SSE Use Standalone Lazy Heels Version - If you dont want Hellgirl boots to sink into the ground - Setting 5 is good. Source is included. Knock yourself out. Makes it possible to tweak various things directly in game that normally would require Creation Kit work. 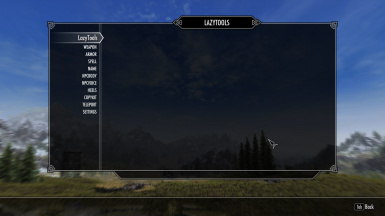 Useful if you want to make a quick change, play around with ridiculous tweaks or maybe just do some tests for mod edits. If you want to see what the man behind the curtain is up to source is included. For those using a logviewer like SnakeTail filter for "LazyTools" to find the relevant output in your papyrus log. 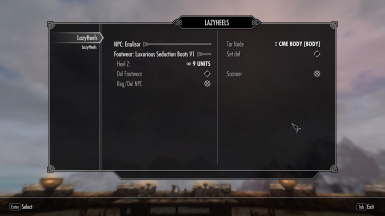 Makes it possible to tweak damage, weight, range etc of any weapon, vanilla or modded. All weapons of the same type will be affected meaning it's possible to make global changes if you think something is too powerful or too weak. It also makes it possible to use any weapon for as long as you want, just boost it as you level up to keep it viable! 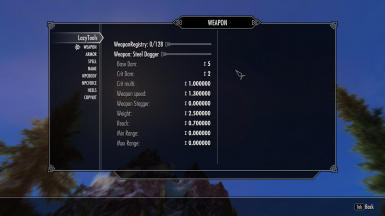 Works the same as the weapon editor but also has the option to change the type of a piece of armor or clothing. Want to slay dragons in nothing but your wedding dress? No problem, just change it to heavy armor for the perk boosts and buff the armor rating! 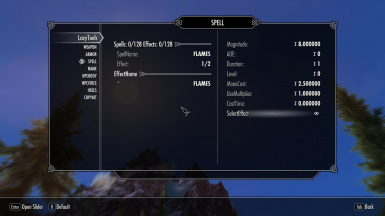 Tweak damage of any spell including those with more than one effect. Pyromaniac in you not feeling the burn? Set the duration of flames to 9999 and leave a wake of burning corpses behind you! Tired of Meeko getting in your way every damn time? Why not give him that nickname you call him every time he does? Or why not give your adopted kids or spouse a last name? 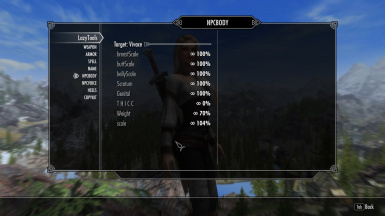 Want to give yourself or a NPC an unique look but don't want to install or create a mod with custom body override for it? Use this to make sure it stands out in all the right (wrong?) places. 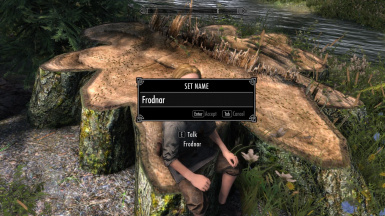 Found the perfect follower mod only to find it has the most obnoxious voice? The voice editor can change it to any of the default vanilla voices for a more pleasurable experience. Or if you're curious what your animal companions would say if they could talk why not give them a human voice and find out? Finally got a stylish pair of modded high heels only to find they plant your feet firmly underground? Use the heels editor to lift yourself up as they should. Works on NPCs too! The sincerest form of flattery is imitation so why not rip a NPCs outfit straight off, weapons included, if you like it? Or maybe you want to quickly make sure your entourage is wearing matching outfits? Just copy everything your character is wearing instantly to them! 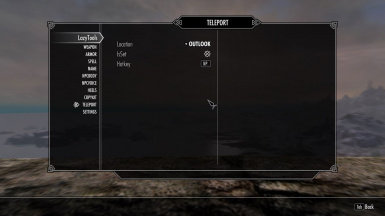 Teleport yourself to any of five custom set and named locations. Great if you just finished that quest halfway down to the center of the earth, save yourself the tedious return and instantly recall straight back to the quest giver! A majority of the changes aren't permanent so the mod will store them and re-apply on game load. This menu will disable this meaning the changes will revert. Don't worry, the registry isn't wiped so if you change your mind just enable the module and they'll be reapplied again. Heel system - This doesn't use any looping scripts or cloak effects to continuously check the wearer. This makes it very resource friendly but unfortunately not 100% instant. As a result the heel value may not be immediately applied on game load to the player but delayed to the next update (changing cell, sitting->standing up etc) instead. Body Editor - Don't use this on anyone mounted. Requires XP32 skeleton with Enhanced Character Edit support. If changing weight causes a neck seam reapply the settings. 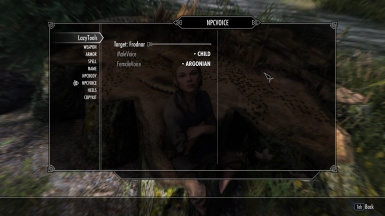 Voice Editor - Using this on NPC both vanilla and custom may break their dialogue if it uses voicetype unique lines. If it happens unregister them and they will revert to their default. 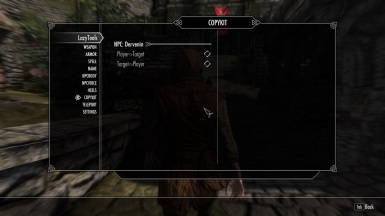 Copykit - NPCs will generally switch back to their default gear sooner or later. This is because they have a set default outfit the game will apply. It's possible to disable this by accepting the option to override this with an empty outfit. If you use mods that handle outfit management do NOT use this. General - Deleting a registered change will in many cases require saving, exiting and loading for it to be visually reverted. This is due to the game caching a lot of data and reusing it in the same session.